In the 1930’s my family bought the heart of the land that makes up Buck Creek and started farming and raising cattle, chickens, and pigs along with horses, dogs and cats… animal husbandry and a tie to the land is in our roots. It is because of this history that we raise animals today and farm the fields that they live on… of course we have learned along the way as we become more artisanal and sustainable in our approaches but in the end it is our love for our faith, our family, the land and our animals that drives us forward. 100% Grass Fed & Grass Finished Beef that has never been fed grain, and is feedlot, antibiotic & hormone free. Raised on farmland that is pesticide and herbicide free using sustainable methods and low stress techniques. At Buck Creek we started with selecting "heritage" cattle breeds (Angus, Shorthorn & Galloway) that would flesh easy on grass. To get to our objectives we added Galloway bulls to our herd to get smaller crossbred cows and calves that would be efficient on grass alone. Our cows are now smaller in size that makes them more efficient grazers that are good mothers raising vigorous calves that grow fast. Then we added Shorthorn bulls to improve our fleshing ease yet again and cross in genetics for our calves that create a highly marbled beef on grass. Our calves are selected for slaughter between 20 and 27 months. This more mature animal allows for the meat to marble "finish" unlike younger animals...think of like this, it is easier to put fat on a middle-aged man than it is a young teenager. Because of this our calves will be larger in size and will marble well giving you a better tasting product, many of our calves will grade "choice" which is fantastic! Like in many “fine” restaurants after slaughter our beef is aged between 14 and 21 days depending on the weight of the animal to create an even more tender product with an even more “beefy” taste. 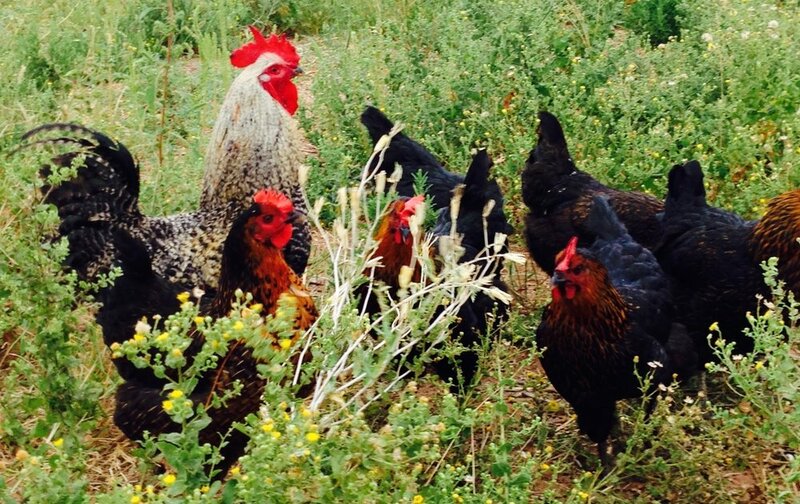 Our Chicken is raised the old fashioned way: on fresh green pasture and wholesome, non-GMO feed. Our farmers model has been developed over the last twenty years and allows he birds to be raised on a cleaner, healthier, happier environment doing what chickens like to do. Our birds are raised in a drug free setting and are never given antibiotics, steroids or arsenic. Then they are harvested humanly right on the farm in a Texas state inspected processing facility keeping the stress as low as possible! 100% Grass Fed & Grass Finished Lamb that has never been fed grain, and is feedlot, antibiotic & hormone free. Raised on farmland that is pesticide and herbicide free using sustainable methods and low stress techniques. At Buck Creek Lamb is a newer venture with us purchasing our herd in early 2017. We began with a crossbred Dorper x Barbado ewe lamb herd and immediately purchased a nice black-headed Dorper Ram. Dorper and Barbado sheep are consider “hair” sheep vs. “wool” sheep and are thus prized for their easy growth characteristics and their resistance to pest thus making them it easier to keep them pest free therefore resulting in a healthier lamb that gains weight quicker. The pastures they are raised on are grass & legumes based and are nutrient, protein and carbohydrate rich making the perfect food for happy and growing lambs! Our lambs are grown on these pastures alongside their mommas until they reach 80-100 pounds prior to processing. This attention to detail produces some of the best lamb that you can put in your mouth. Because of this lamb sells out quickly so put your order in early so you don’t miss out. 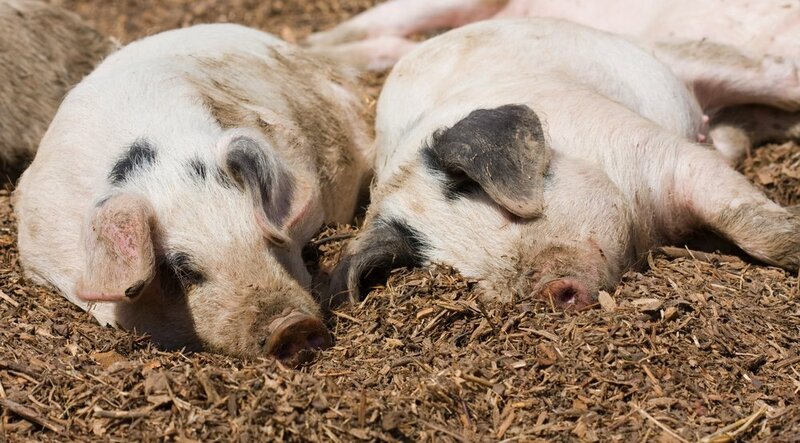 The pigs are heritage Berkshire & Duroc breeds that are raised on clean pastures that are rotationally grazed that creates healthier and happier environments. The animals are also raised chemical free creating pork that is extra delicious that you are not afraid to put in your body. This care also means happy stress free pigs that enjoy just being a pig! The hens (egg chickens) at Buck Creek are truly “free-range”! These chickens are raised on the same pastures as the other animals where they can “be a chicken” scratching for bugs and seeds while consuming as much fresh grass as they desire! They are housed in a mobile hen house at night to protect them from predators and provide a convenient place for them to lay their large brown eggs. There is nothing happier and stress free than a chickens life at Buck Creek.